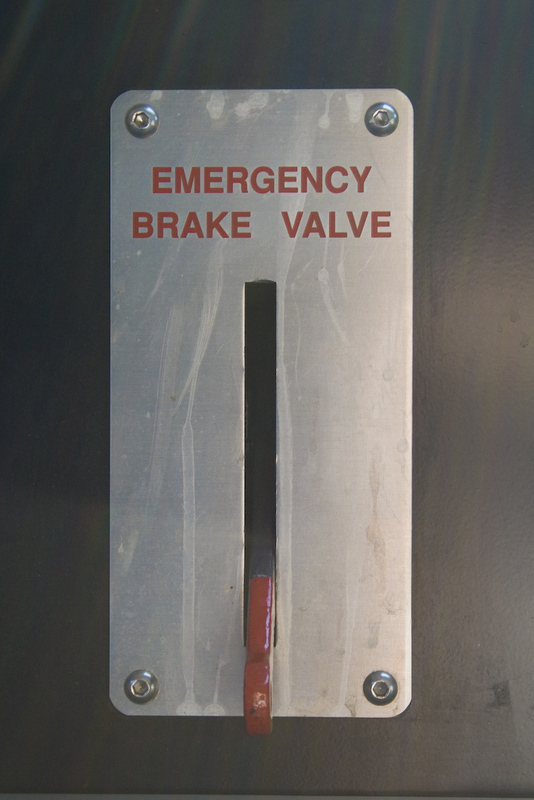 When to Use the Emergency Brake? If you have ever taken any sort of train you have seen that foreboding red device, the emergency brake. When do we use it? The New York Times’ City Room blog recently featured a video answering just that question. The video–“Emergency Brake”–is by Casey Neistat, who risked arrest and prop limbs in the making of his production. The basic moral of the story is that the emergency brake should never really be used while a train is in motion. Do not use in the case of a fire, you’ll burn. Do not use in the case of a medical emergency, the person will be caught in greater peril. Do not use in case of a crime, you’re trapped with a criminal (probably armed and now angry). The emergency brake should be saved for those times when the train is in the station and somebody is in danger, either caught in the door or fallen onto the tracks. 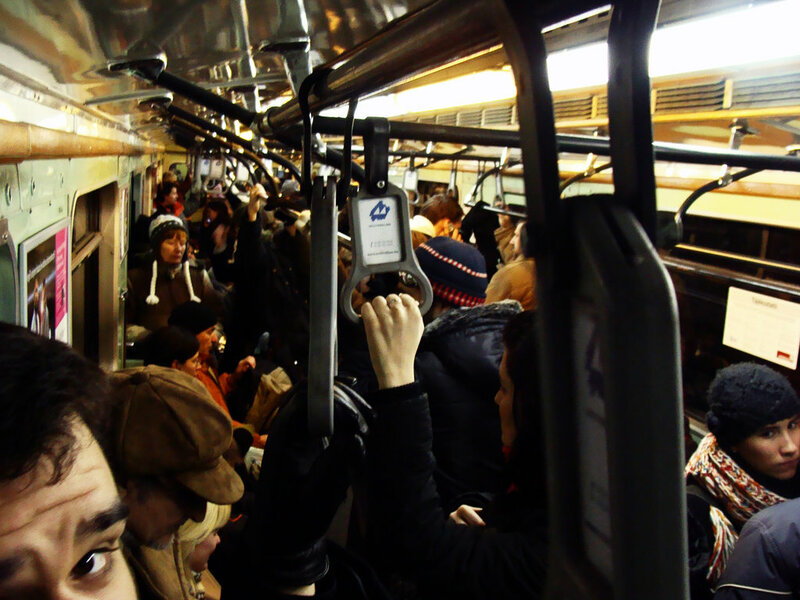 According to the Times, straphangers should pull the brake if “someone gets caught between the train’s closing doors, or between subway cars, and is about to be dragged to an unenviable fate.” In other circumstances, pulling the cord could make it harder for help to arrive. That’s what happened on a D train last November when a straphanger fatally stabbed another commuter and frightened passengers pulled the brake. The agency has told Gothamist that when a straphanger pulls the cord, it brings the train to an immediate stop using compressed-air brakes. The train crew must notify a control center, which in turn alerts police. The NYPD then advises the control center on how to respond, and that message is relayed to the train crew. It can take between 5 and 15 minutes for the crew to reset the braking function and get the train moving again. What If Airport Fears Affect Other Transit Forms? The attempted terrorist-attack on a Christmas flight to Detroit ended in the inevitable security restrictions on international flights, including the removal of blankets in the last hour of flight. While the New York Times was wondering how terrorism has affected the American desire to travel and Slate was commenting on the idiocy and inefficacy of our security spending I have been wondering what would happen if another form of transit were attacked. Our transportation security measures are incredibly reactionary rather than visionary or proactive. Just look at how much security there is when boarding a plane and how non-existent a real security presence is at an Amtrak station or major bridge entrance. I am afraid both of the consequences of this passivity and the consequences of potential increased security. Forgive me for my non-politically correct statement, but it is rather surprising that a terrorist has not struck an American train as happened in Spain in 2004 or another place of large congregation such as a bridge entrance or bus terminal. After all, that has to be a lot easier to do than getting through airport security. As much as I fear the tragic consequences of such an act, I am more afraid of Americans having their mobility restricted. Terrorists almost certainly are more likely to hit a train or bus than a series of cars on I-95. Therefore restrictions are likely to hit passengers getting on trains and buses, even commuters and regular subway and bus riders. Not only is this extraordinarily costly as the TSA demonstrates, but it may serve to do exactly what this country does not need: promote cars over public transit. 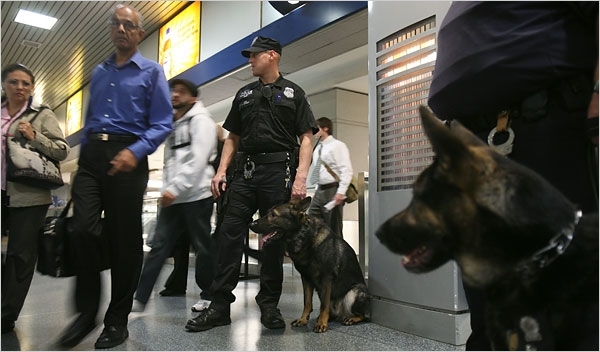 I’m not saying that police should not patrol transit stations and dogs should not sniff luggage lying around and that passengers should not report suspicious activity, but making train security similar to airplane security could kill any high speed rail venture. America’s transit future depends on development and transportation investment that encourages and allows people to travel together rather than individually. Of course communal transit is more attractive to a terrorist (the same reason we go crazy when an airplane crashes but most ignore individual car crashes even though cars claim thousands more lives than planes do). America’s economic and cultural future depends on the population having equal freedom of physical movement as it does freedom of ideas and personality via electronic transmission and paper delivery. American security agencies must keep Americans safe on the rails and the roads as well as in the air. However, placing similar restrictions on train riders will have disastrous consequences as time-savings via train are not nearly as dramatic as via flight. To keep us safe the work must be done behind the scenes, not by aggressively screening every passenger and forcing unnecessary restrictions while riding and boarding. Today I would like to connect infrastructure improvements to both jobs and social interactions. With all the talk of the thus-far jobless recovery, investment in transportation and other infrastructure may never be more important. We have shipped so many of many of our manufacturing jobs overseas, and that has dramatic consequences because the people who used to have those jobs are not trained to suddenly take desk or service jobs. However, construction and its related needs–such as concrete production–cannot be shipped overseas. “Since the beginning of our republic, transportation and infrastructure have played a central role in advancing the American economy — from the canals of upstate New York to the railroads that linked the heartland to industrial centers and finally the interstate highway system that ultimately connected all regions of the nation. It’s almost as if we no longer understand the crucial links between infrastructure and the health of the American economy, the state of the environment and the viability of the nation as a whole. We’ve become stupid about this. While it is a tangential connection, I would like to suggest that building improved transportation infrastructure is also important for the social capital of this country. We are becoming increasingly disjointed and independent, living in digital social realms and within cubicles that frequently separate us from each other, getting to work individually in cars. It is rare outside the sporting event and church that we feel immersed in communal space and the larger venture that we acknowledge as society. Slate recently wrote about social interactions on the subway and how people react to certain requests, such as the ability to take a seat. There is a certain etiquette to traveling on public transportation, and admittedly different rules for different modes in different places. However, it is amazing how the little things of seeing people of different socio-economic status, age and ability is of great value to our sense of place and understanding. Moreover, transportation is the great uniter. Working for the MBTA this past summer, everyone always reacted to my experience with a story or notion about public transit. Getting people out of their cars and into shared spaces is an important element of reuniting a divided society and to do it we need to invest in infrastructure, one of the keys to jobs for people of all talents and classes, going forward. I can still hear that click-clack rhythm of hoofs beating in some recess of my memory. For those of you familiar with the poem, the tale of two Revolutionary War era lovers torn asunder by King George’s Army, you know that the Highway Man comes to an untimely end on the road in the glow of a midnight moon. This was my first literary exposure to the danger of transportation, but we all grow up knowing that transportation is an inherently dangerous activity. Transportation will always be dangerous as long as human actors are making decisions about rapid movement and operating fast-moving and heavy vehicles. However, there should be an imperative to make transportation as safe as possible. Two pieces of news strike this chord. First, Britain has outlawed texting while driving. Britain’s new guidelines state that using a hand-held phone when causing a death will “always make the offense more serious” in terms of punishment and lead to prison time. Texting is given special treatment. I hope that Britain’s action is a lead for federal US legislation. Some states have already begun down this path, but the feds can outlaw texting while driving as easily as they create a national drinking age of 21. Simply connect federal transportation (namely highway) money to laws banning texting while driving. That certainly passes constitutional muster. Second, Transportation 4 America has reported that 76,000 Americans have died in the last 15 years while walking in or along a street. The FDA wants to ban summer oysters because 15 people (largely people with liver problems) a year die from food poisoning but this nation has yet to take pedestrian and road safety seriously. This report also analyzes state and regional spending of federal transportation dollars on pedestrian safety, finding that many of the metropolitan areas in greatest need of improvement are spending the least amount on pedestrian safety projects. Nationwide, less than 1.5 percent of funds authorized under the federal transportation law, SAFETEA-LU, have been allocated for projects to improve the safety of walking and bicycling, even though pedestrians comprise 11.8 percent of all traffic deaths and trips made on foot account for almost 9 percent of total trips. SAFETEA-LU created a new safety program and changed regulations to make it easier to use what were once “highway funds” on a wider variety of transportation projects, including public transportation and pedestrian facilities. At the state and local levels, no state spends more than 5 percent of federal transportation funds on sidewalks, crosswalks, traffic calming, speed humps, multi-use paths, or safety programs for pedestrians or cyclists. This is in spite of a more than 30 percent increase in total federal transportation dollars to states with the passage of SAFETEA-LU in 2005. The 52 largest metro areas averaged annual spending of federal funds on bicycle and pedestrian projects of just $1.39 per person. The average metro area spends 2.2 percent of their federal transportation funds on projects to improve conditions for walking and bicycling. I’m not really sure when we will wake up to the fact that we are a multi-modal nation and that our culture of depending on cars to get us everywhere actually gets us nowhere. The number of deaths to pedestrians is downright unacceptable. It is a sign that we do not encourage walking enough, that we subsidize driving to an unhealthy degree, and that our development and growth has poorly prioritized the types of communities where people can travel safely without turning on a motor. In Friday’s New York Times was an article about the French bicycle renting system, Velib’. I was disappointed to learn that the system is being plagued by vandalism and theft. According to the article, the bike-renting service provides 50,000 to 150,000 rides per day. However, 80% of the original 20,600 bicycles have been stolen or damaged. Much of the crime has to do with Paris’s social inequalities and perceived economic and class dynamics of the transportation mode. The heavy, sandy-bronze Vélib’ bicycles are seen as an accoutrement of the “bobos,” or “bourgeois-bohèmes,” the trendy urban middle class, and they stir resentment and covetousness. They are often being vandalized in a socially divided Paris by resentful, angry or anarchic youth, the police and sociologists say. Bruno Marzloff, a sociologist who specializes in transportation, said, “One must relate this to other incivilities, and especially the burning of cars,” referring to gangs of immigrant youths burning cars during riots in the suburbs in 2005. He said he believed there was social revolt behind Vélib’ vandalism, especially for suburban residents, many of them poor immigrants who feel excluded from the glamorous side of Paris. The Velib’ has expanded beyond the Parisian urban core to 29 other towns and suburbs. I hope that there are solutions to the problems the Velib’ faces in Paris, because I would love this to be a viable model for other cities and towns around the world, and especially in the US. While Paris requires a credit card to borrow a bicycle and fines individuals for not returning bikes perhaps they should consider making users better internalize the costs true to form of most car rental systems, including Zipcar. When you rent a car you can frequently choose to forgo paying for insurance, but most drivers purchase it in case of an accident. Perhaps Velib’ should make riders pay more for the costs of damage and stolen bicycles and offer insurance to cover such costs. In addition, social ownership of public transit is a problem throughout the world. In order to keep public transportation clean and well respected the riders must feel a sense of ownership for the system and a sense of responsibility toward keeping it safe and productive. I know very little about French socioeconomics, but perhaps more bicycles need to be placed in urban neighborhoods. Perhaps there need to be discount rates for the underprivileged. Whatever solutions are available, I hope they can be implemented so more cities look to Paris as a model rather than a warning. In unrelated news, the New York Times also had a quirky and enjoyable vacation feature on the Station Inn in Cresson, PA. It sort of looks like the nightmare train scene from My Cousin Vinny, but it also looks like a really fun vacation. The Station Inn provides railside views of dozens of freight trains passing through every day and people come from all over the world to watch the trains and discuss rail trivia. I mostly would want to go to sit on the porch and hear all the rail enthusiasts chat it up. However, something tells me my partner would not be interested in such a trip. The clash between builders and preservationists is as old as architecture itself, but it reached a fever pitch in the recent gilded age. And it is especially fraught in Germany, where the construction boom that began with the country’s reunification sometimes seems like a convenient tool for smoothing over unpleasant historical truths. Few current projects better illustrate this conflict than Stuttgart 21, a plan to build an enormous new railway station, along with 37 miles of underground track, in the heart of this old industrial city. The $7 billion development, which is expected to be approved by the end of the year, is part of an ever-expanding high-speed train network that planners hope will one day link the entire continent. As one of the largest developments in Europe, it could radically transform the city center. But the design shows a callous disregard for architectural history. Its construction would require the partial destruction of one of the city’s most recognizable landmarks: the Hauptbahnhof, Paul Bonatz’s Stuttgart central rail terminal, a monument of early German Modernism built from 1914 to 1928. Car have rest stops and airplanes have airports, but no means of transportation has a place to intersect with the mode quite like railroads and their train stations. Train stations can be magnificent like Grand Central Station and 30th Street Station. Classic train stations have also frequently been ruined and mocked, like New York’s Penn Station (H/T Infrastructurist). I appreciate the efforts in Stuttgart to build something magnificent and memorable and forward thinking, but it should not come at the expense of history. There are certain buildings and places that stand as landmarks and should be preserved not just as art, but also for the sanctity of the identity of the city. I also believe rail stations should be alluring to the passenger. Airports and highways are conveniences of necessity. Railroad stations should not just be practical spaces, but entrances and destinations. The new design for Stuttgart is impressive, but I hope they can preserve the current station while making the additions. Railroads are promoted for their convenience as usually being placed in the middle of cities, as opposed to major highways and especially airports. Those train stations should be city jewels and once built be part of the identity of the city for years to come. Cities are frequently defined by their architecture, whether it is skyscrapers and bridges. The appearance of trains is guaranteed to change over the decades, but a train station can always be a classic. I only hope that trains will be in such demand that stations must grow to accommodate the traffic, but they should not be changed such that they lose their souls.